Former Trump campaign chairman Paul Manafort was sentenced to a total of seven and a half years in prison Wednesday after a federal judge rejected his appeal for no additional time and rebuked him for his crimes and years of lies. Within minutes of the sentencing, prosecutors in New York announced Manafort has been indicted on 16 new charges, including residential mortgage fraud. Manhattan District Attorney Cyrus Vance announced that the new charges were filed in state Supreme Court last Thursday, alleging Manafort and others falsified business records to illegally obtain millions of dollars. At Wednesday’s hearing, U.S. District Judge Amy Berman Jackson sentenced Manafort to nearly 3½ years in prison on charges that he misled the U.S. government about his foreign lobbying work and encouraged witnesses to lie on his behalf. That’s on top of the roughly four-year sentence he received last week in a separate case in Virginia. Manafort, 69, faced up to 10 additional years in prison after pleading guilty in Washington to two counts of conspiracy against the United States that included a range of conduct, from money laundering to unregistered lobbying, and a second count related to witness tampering. He was convicted of bank and tax fraud in Virginia, where a judge last week sentenced him to 47 months in prison for tax evasion and other financial crimes. That sentence was far below sentencing guidelines that allowed for more than two decades in prison, prompting national debate about disparities in how rich and poor defendants are treated by the criminal justice system. Jackson said at the outset of the hearing that she would not be swayed by last Thursday’s sentence by U.S. District Judge T.S. Ellis. 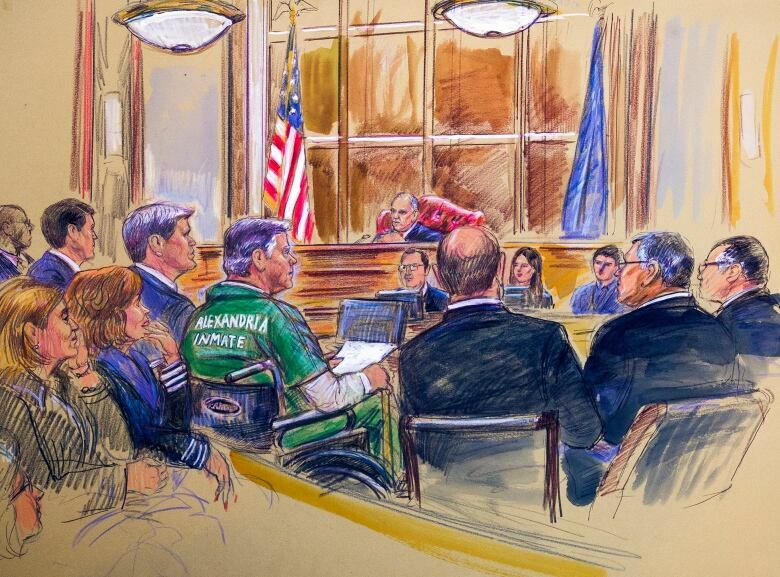 Manafort, who has gout, a form of arthritis, entered Jackson’s courtroom in a wheelchair. Jackson ruled Manafort should get a tougher sentence because he acted in a leadership role, directing others to participate in a crime, rejecting a defence argument that the sentencing enhancement should only apply to those who lead criminal organizations. But she said Manafort should get credit for acceptance of responsibility, because he pleaded guilty to the conduct at issue. A prosecutor with special counsel Robert Mueller’s office said Manafort didn’t deserve any credit because he repeatedly lied to investigators and the grand jury after his guilty plea. Prosecutor Andrew Weissmann did not recommend a particular punishment for Manafort, but delivered a scathing assessment of Manafort’s crimes, saying he concealed his foreign lobbying work, laundered millions of dollars and even coached other witnesses to lie. Unlike at his sentencing hearing last week, Manafort said he was sorry for his actions, but Jackson then told him his expression of remorse rang hollow. “I am sorry for what I have done and for all the activities that have gotten us here today,” Manafort said. Jackson told Manafort that he had lied repeatedly and committed fraud repeatedly, and there was no good explanation for the leniency he sought. “Saying ‘I’m sorry I got caught’ is not an inspiring plea for leniency,” Jackson said. “The defendant’s insistence that none of this should be happening to him … is just one more thing that is inconsistent with the notion of any genuine acceptance of responsibility,” the judge said. She sentenced Manafort to 60 months on the first count, half of which would run concurrently with the Virginia case, and 13 months on the second count, to be served consecutively — adding 43 months on top of the 47 months he received in the Virginia case. That’s a total of seven and half years in prison, minus credit he is expected to get for nine months already served. Jackson ruled on Feb. 13 that Manafort had breached his agreement in the Washington case to co-operate with Mueller’s office by lying to prosecutors about three matters pertinent to the Russia probe including his interactions with a business partner they said has ties to Russian intelligence. Jackson’s sentence may mark the end of a two-year-old legal battle between Manafort, a veteran Republican political operative who worked for Trump’s campaign for five months in 2016, and Mueller, who made exposing Manafort’s covert lobbying for pro-Kremlin politicians in Ukraine a centrepiece of his Russia probe. collusion between Russia and the Trump campaign. “But for a short stint as a campaign manager in a presidential election, I don’t think we’d be here today,” Manafort lawyer Kevin Downing told Jackson, and asked her to take media coverage of the case into account in determining the sentence. On Tuesday night, Mueller’s prosecutors updated a judge on the status of co-operation provided by one defendant, former national security adviser Michael Flynn, and are expected to do the same later in the week for Rick Gates, Trump’s former deputy campaign manager. The Mueller team has prosecuted Manafort in both Washington and Virginia related to his foreign consulting work on behalf of a pro-Russia Ukrainian political party. The decision last week by U.S. District Judge T.S. Ellis III to sentence Manafort to 47 months stunned many who’d been following the case, given both the guideline calculation of 19.5 to 24 years in prison and the fact that the defendant was convicted of hiding millions of dollars from the IRS in undisclosed foreign bank accounts. Manafort has been jailed since last June, when Berman Jackson revoked his house arrest over allegations that he and Konstantin Kilimnik, a Russian-Ukrainian political consultant, sought to influence witnesses by trying to get them to testify in a certain way. Trump has not ruled out a presidential pardon for Manafort, and after last week’s sentencing said “I feel very badly” for his former aide. Trump, as president, can issue pardons for federal crimes, but not for state offences.